Doris Mary Ann von Kappelhoff (born April 3, 1924) is an american singer, actress, and animal welfare advocate known as Doris Day. A vivacious blonde with a wholesome image, Day was one of the most prolific actresses of the 1950s and 1960s. Able to sing, dance, and play comedy and dramatic roles, she has been an all-round star whose personality has permeated many popular and diverse movies. Doris grew up in a suburb of Cincinnati, Ohio. She started out a dancer, but at an early age an automobile accident prevented her from furthering a career in dance. Doris grew up in a suburb of Cincinnati, Ohio. She started out a dancer, but at an early age an automobile accident prevented her from furthering a career in dance. She began taking singing more seriously after her accident and her mother got her a vocal coach. It wasn't too long after that, that she was able to get jobs singing. The band leader Barney Rapp was opening a club and looking for a female vocalist and picked her. He wanted to put her name on the marquee but thought that Kappelhoff was too awkward of a name and they arrived at Day (inspired from the song ?Day After Day?). She never really liked the name but after not coming up with anything else Day stuck. She ended up touring and singing with other bands such as Les Brown's singing hits such as ?Sentimental Journey?. Later she became a film actress and starred in movies such as Pillow Talk and The Man Who Knew Too Much. She now has been in 39 movies and recorded near 1,000 songs. 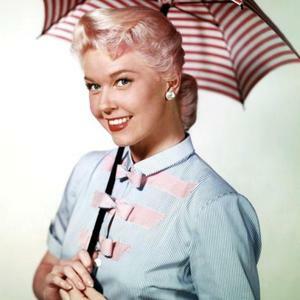 In 2011 Doris Day recorded her 29th studio album, My Heart. The My Heart Songfacts reports that it was released in the UK on September 5, 2011, six months after Doris Day had turned 87. It debuted at #9 on the British album chart making her the oldest artist to score a UK Top 10 with an album featuring previously unreleased material.